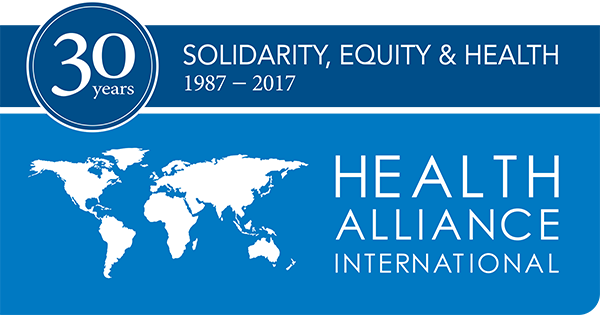 At the 2016 World Social Forum, Health Alliance International, the Health and Trade Network, PHM, and colleagues from across the globe came together to highlight our struggles against unfair and undemocratic trade agreements that threaten our right to health. In an effort to share our alternative view of trade, this document reflects the thoughts of participants during the last of our series of three sessions on health and trade. The points below were developed collectively by participants to the session, What would a “healthy” trade agreement look like?. Prosperity, sustainability, protection of the environment, universal access to healthcare, and health promotion should be the fundamental goals of trade agreements. Fair trade practices, such as better information about products and services traded, should be central to trade deals. We should measure the impacts of trade agreements on happiness, well-being, and quality of life. The process by which a trade deal is negotiated should take a human rights approach and be based on transparency and inclusiveness. States must acknowledge the fundamental conflict between corporate interests and public health. Trade agreements should place health promotion and disease prevention policies before commercial interests. Trade agreements should be written in common, accessible language, not in legalese! Trade agreements should explicitly require the participation of local populations (in particular of indigenous communities) from the very beginning of the negotiations – as well as to clearly define the ways by which these populations are involved in the process-both in Global North and Global South. Trade agreements and investments should respect sovereignty and be negotiated in partnership with local populations, requiring their consent. Representative public interest groups and civil society should be meaningfully involved in the process of making trade agreements, not a handpicked few. State-owned enterprises should receive legal protection in trade agreements. Trade agreements should require companies to invest a certain percentage of profits in health-related projects in countries where they operate or trade. Tariffs should be proportional to a company’s behavior (good or bad), and there should be incentives for good practices. High tariffs should be maintained on unhealthy products such as tobacco, alcohol, sugar and transfats. Money collected from tariffs should be used to modernize production to benefit environment, health, and workers in low-income countries. Trade agreement provisions should require companies to protect access to affordable healthy food, clean water, health care, housing, education, work, physical space planning and the many other elements of a healthy life. Privatization of certain benefits should be prohibited. Public and private healthcare and water services should be excluded from international trade agreements. Large scale investments such as fracking, wind farms, mining and private hospitals should be permitted only with the consent of local populations. The impacts of international trade on climate change should be minimised by enforcing heavy fines on companies’ carbon outputs and encouraging local, sustainable trading practices. Scrap the investor-state dispute settlement system! Companies should should use national legal frameworks to resolve conflicts. Trade agreements should include a legal framework through which people can sue corporations for the highest standard of public health and the environment and ensure that people have equal rights as corporations to sue companies for malpractice. Companies and states operating under international trade agreements should agree to a minimum and maximum wage for all employees and contract workers. Trade agreements should emphasize worker safety, real living wage, consumer protections, and allow for freedom of movement across borders. Militaries or militarized police should not enforce trade agreements. iI people or nations want to back out of a trade agreement, they should be able to do so without military or police involvement. Trade agreements should include a mechanism that allows new evidence on their impacts to trigger amendments which protect people’s health, rights and environment.